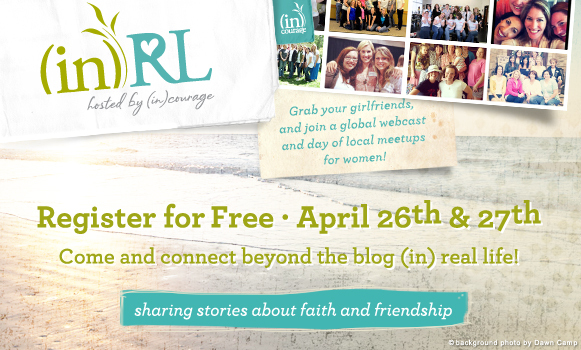 Because I'm pretty sure you're going to want to be part of Dayspring's Incourage In-Real-Life ((in)RL) meet-ups! I co-lead one of inCourage's groups for single ladies (we are starting up again in February, be on the lookout for more information), and I just love what they do to encourage community among women. This is one of their initiatives...they like to think of it as a "free girls' weekend that doesn't require a plane ticket." Registration is FREE, and the weekend starts with a webcast on Friday, April 22nd, and moves on to small community-hosted groups all over the country on Saturday, April 23rd. This year's theme is "Staying Rooted In Community Through Tough Times." Doesn't that sound like a fantastic time? You can check it out and register HERE (and if you register today, you get a few extra perks!). Hope you can find a community and join!